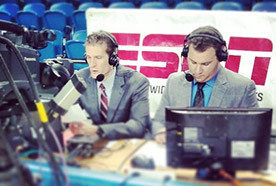 Richie Schueler is currently a college basketball analyst on the ESPN Family of Networks. Since 2012, he has extensively covered several difference conferences across the nation, including the Big West, Mountain West, West Coast (WCC), and Big South. Schueler delivers an energetic and fun style to the broadcasts he's a part of! He utilizes his knowledge from ten years as a college basketball coach by educating the audience from a head coach's perspective. His unique skill set provides insight to the viewers on the psychology happening inside the game, differing coaching decisions, and various in-game situations that occur throughout the course of each broadcast.